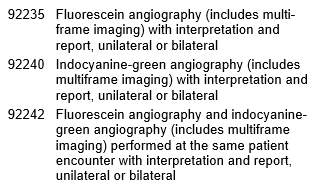 Q What are fluorescein and indocyanine-green angiography (FA and ICG) performed with the optomap? A The optomap fa provides an ultra high resolution, ultra widefield angiography and color image, up to a 200 degree view of the fundus in a single capture. A fluorescein dye is injected in a vein and images are captured as the dye passes through the vessels in the back of the eye. The ultra widefield view offers clinicians enhanced angiographic information to help monitor and diagnose eye conditions and to assist in treatment determinations. The optomap icg is an angiographic imaging application of Optos’ California device. It provides an ultra high resolution, ultra widefield angiography, allowing the entire retinal vasculature to be imaged. A Yes, for covered indications and as part of the overall evaluation and management of disease. For example, FA following treatment of choroidal neovascularization (CNV) is necessary to monitor for recurrence or to detect additional treatable lesions. Medical necessity for testing usually occurs in the presence of a change in the clinical assessment. These codes are subject to Medicare’s Multiple Procedure Payment Reduction (MPPR). This reduces the allowable for the technical component of the second and/or lesser-valued test when more than one test is performed on the same day. For Part C Medicare (Medicare Advantage), determination of benefits is required to identify beneficiary financial responsibility prior to performing noncovered services; MA Plans may have their own waiver forms and processes. 2 80 FR 70885 CMS-1631-FC. 2016 Medicare Program; revisions to payment policies under the physician fee schedule. Pg.71066. Published Nov 16, 2015. Accessed 01/05/18.